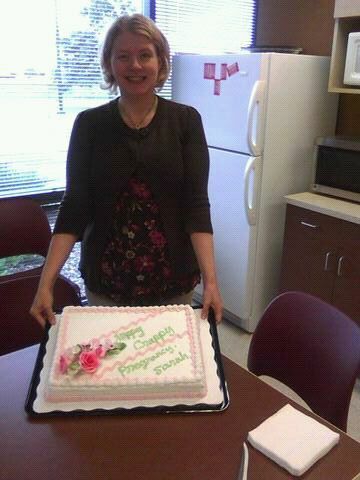 Bad Cell Phone Pic, but the cake says - Happy Crappy Pregnancy! ﻿ Moral of this story.... ask and you shall receive! Oh, Sarah, you are seriously adorable! loves it!!! More importantly, how did it taste? Nice! Good friends you've got there. Ann... I have had bad cake cravings this pregnancy, so it was of course delicious. Glad it was delicious and hit the spot for you! Love it . . . and you look sooo cute too! Meanwhile ... you look amazing!! !